Some songs are meant to make you blush. The Pixies’ “Gigantic” for example; once you learn the “inspired by the film Crimes Of The Heart, in which a married woman falls in love with a black teenager, backstory” it becomes impossible to regain those initial innocent thoughts of it being about a swelling of the heart. 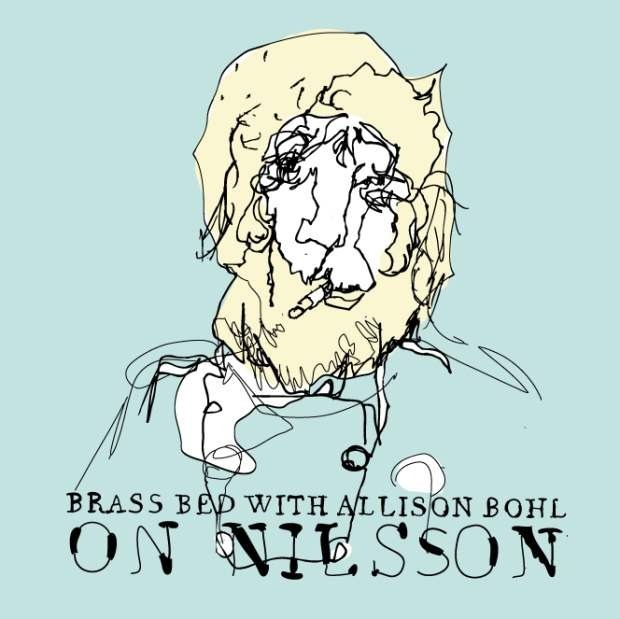 Brass Bed and their adorable friend Allison Bohl dug up a blush-worthy gem written by Harry Nilsson originally written for the soundtrack to the film Popeye. A director by trade, Bohl can add fine-impersonator to her credentials as she masterfully embodies the Olive Oyl character on “He’s Large”. Nilsson could probably write a brilliant song in his sleep or in a drunken stupor, but he was arching towards divinity when he penned “He’s Large.” In the context of the film and the Bluto character, “He’s Large” is family friendly. Hear it any other context and you’ll go eight shades of red instantly. Brass Bed and Bohl originally covered Nilsson for a tribute night, but had so much fun with Harry’s songs they took to the studio. On Nilsson is out March 13 on Crossbill.